Is it time to upgrade customer service? Make Positively Outrageous Service the theme for your next event, meeting or organizational initiative. The best and most beautiful things in the world cannot be seen or even touched - they must be experienced with the heart. Be true to yourself. Make each day a masterpiece. Help others. Make friendship a fine art. Build a shelter against the rainy storms of competition. 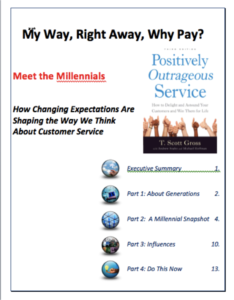 Creating a culture of "Positively Outrageous Service", and delivering on the promise of extraordinary customer service creates a new dawn of business opportunity. Your clients guests, or members sharing experiences radiating positive word-of-mouth referrals generating more business than you could ask or imagine. Is it time to upgrade the level of your customer service? Next level customer service involves leadership, culture and process. By the way, we make it fun!!! 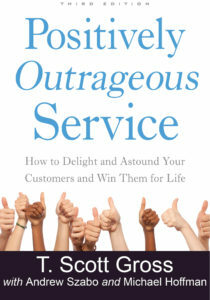 What is Positively Outrageous Service? PLUS Receive our fun weekly customer service story and quick actionable tip!